Among the debuts at the ongoing 2014 Chicago Auto Show is the 2014 Nissan GT-R Track Edition, a lightweight and high(er) performance version of the incredible Japanese supercar that will serve as the new trimline in the GT-R hierarchy – even though it will be available in very limited numbers. The 2014 Nissan GT-R Track Edition is powered by the same twin turbocharged 3.8L V6 as the rest of the lineup with 545 horsepower and 463lb-ft of torque although the revamped fuel injection system affords all of the new GT-Rs improved torque response through the midrange as well as stronger throttle response through and mid and high ranges. There is also an oiling system baffle that prevents the oil from sloshing along during stints of spirited driving that serves to improve the longevity of this high performance forced induction engine. Nissan has tuned the suspension of the 2014 GT-R Track Edition to offer even greater performance capabilities with the fine tuning of this system performed at the famed German Nürburgring under the watchful eye of Nissan test driver Toshio Suzuki. This higher performance suspension setup includes Bilstein DampTronic gas pressure shock absorbers and stiffer springs while a special new front air dam channels air to the brakes to keep them stopping well over the course of extended track time. On the inside, the 2014 Nissan GT-R Track Edition sports a set of blue trimmed race inspired seats that are wrapped in a special high grip leather to make sure that the driver and passenger are kept firmly in place when the GT-R starts hammering through the corners. Next, to reduce curb weight, Nissan has removed the unnecessary back seat and replaced it with a lightweight cloth mat that helps to insulate some of the sound from the trunk. There is also the rest of the driver-centric cockpit featuring all of the gauges centered around a large tachometer in a sporty, clean package clad in carbon fiber trim that is found throughout the cabin. On the outside of the new GT-R Track Edition, the carbon fiber lower front fascia is joined by a unique dry carbon fiber rear spoiler and Rays Engineering lightweight wheels wrapped in Dunlop SP Sport Maxx GT 600 DSST CTT ultra high performance run flat tires – filled with lightweight nitrogen…of course. Buyers can pick from five different colors including Deep Blue Pearl, Jet Black, Solid Red, Gun Metallic and Pearl White. Said Pierre Loing, Vice President, Product and Advanced Planning and Strategy, Nissan Americas: "The concept behind the GT-R Track Edition is to enable drivers who enjoy even more demanding high-performance driving than the GT-R Premium and Black Edition models' extreme performance, the chance to come closer to a competition spec vehicle – no back seat, stiffer suspension, higher grip seats, additional brake cooling – the works." Concluded Loing: "The new Track Edition sends the message that when it come to Nissan GT-R performance, there is no endpoint. We will continue to push its development and keep the competition in the rearview mirror. The legend continues." The bad news is that the 2014 Nissan GT-R Track Edition will be limited to just 150 units for the United States and considering that it is a step above the GT-R Black Edition in terms of performance – we can expect it to carry a price somewhere north of the $109,300 price tag of the Black Edition. Luckily, since the actual additions to the Track Edition are few the upcharge between the Black and Track models should be small. Then again, supercar logic is different than that used for the pricing of normal cars but in any case; the 2014 GT-R Track Edition is still going to be well into the six figure range when the pricing is announced. 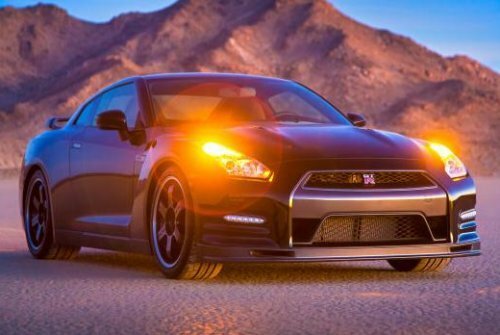 Click here for a look at the pricing for the Nissan GT-R models that are currently available. It will be interesting to see if Nissan announces a new best lap time captured during their Nurburgring testing of the 2014 GT-R Track Edition. The 2013 Nissan GT-R was able to turn a lap time of 7:19.18 (just under a half second quicker than the Chevrolet Corvette ZR1) but the new brake cooling system and refined suspension system of the new Track Edition package could be enough to shave a second or two off of the GT-Rs current best time at “The Ring”.